Juba is at school when the bomb hits. At first, he thinks it is just a high buzzing sound, like a whistle – but then he feels the rumbling of earth, sees the billows of dirt that momentarily mask the horror of what lies before him – the blood, the screams, the fear. 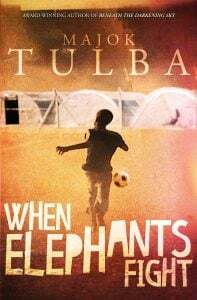 Set in the South Sudanese village of Pacong, Majok Tulba’s second novel When Elephants Fight follows the life of Juba, a young boy forced to grow up too quickly at the peak of the civil war. No longer safe in his own home, Juba must flee the life that he has always loved in search of a refugee camp. The journey that awaits him is long and challenging – but will it be worth it? Will Juba find a safe-haven once more? When Elephants Fight is haunting and raw, but it is also an inspirational tale of resilience, of triumph over adversity. Throughout the novel, there is joy amid deprivation, angels and demons, heaven and hell, happiness and sorrow. Tulba’s debut novel, Beneath The Darkening Sky was shortlisted for the 2013 Commonwealth book prize. Feted by people like author Anna Funder, with headlines like this from The Guardian: Majok Tulba: Born to Write, everyone knew a star was born. It’s no surprise then that When Elephants Fight delivers a powerful punch. Tulba’s writing is like nothing else – incredibly true, stripped back to the core. Told from the perspective of a young boy, the novel’s depictions of war are cloaked in a child-like innocence and purity that makes them all the more haunting and confronting. The stories that Majok Tulba tells are incredibly important and it is a privilege to read his work and be so deeply moved by his words. He is a magical and gifted storyteller. When Elephants Fight is an essential addition to your reading list. We can’t recommend it enough. 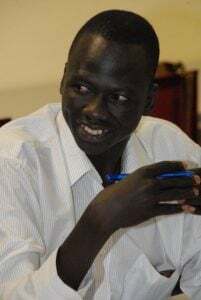 Majok Tulba lives in Western Sydney with his wife and children. He is CEO of the charity SudanCare, has had a film as a finalist at Tropfest, and has won a NSW Premier’s/CAL Literary Centre Fellowship.